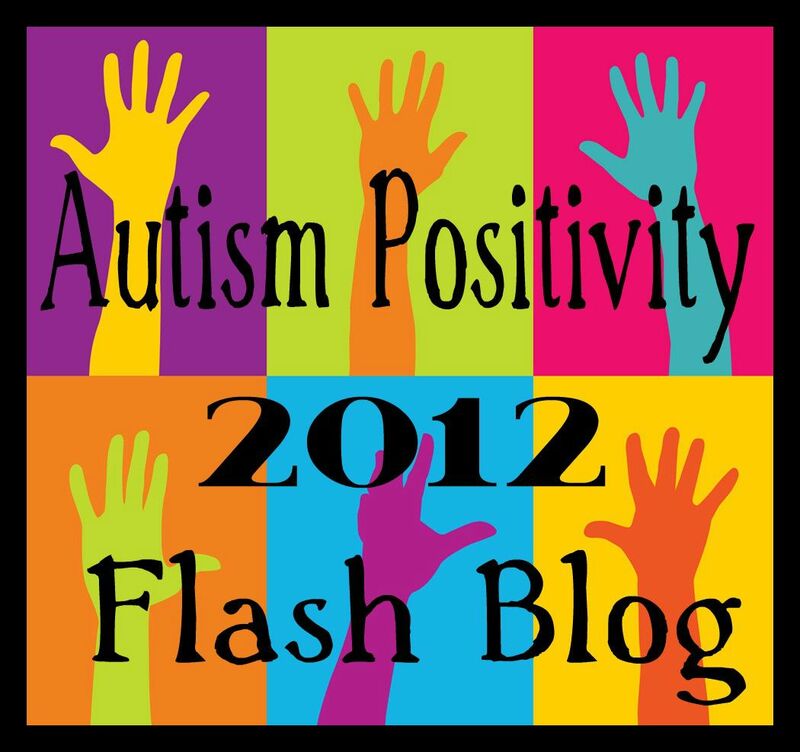 Like many children with autism/Autistic children, H is drawn toward routine – it gives him comfort. He seeks it out and uses it to help him make sense and order of his world. We have deliberately established family traditions, as these are in fact patterned behaviours that have a set of expectations that we can usually count upon… that, and it is fun! Our traditions are changeable and definitely not rigid – our guy brings enough of this to the table without our reinforcing it. We try to laugh at the unpredictability of our traditions and enjoy/embrace any variations or imperfections in these. When I reflect on this – I can’t help but think that I also love traditions and our special family routines and ways of doing things. It gives me a sense of belonging to something over time and a way of marking the passing of time when we revisit our memories of these times together. 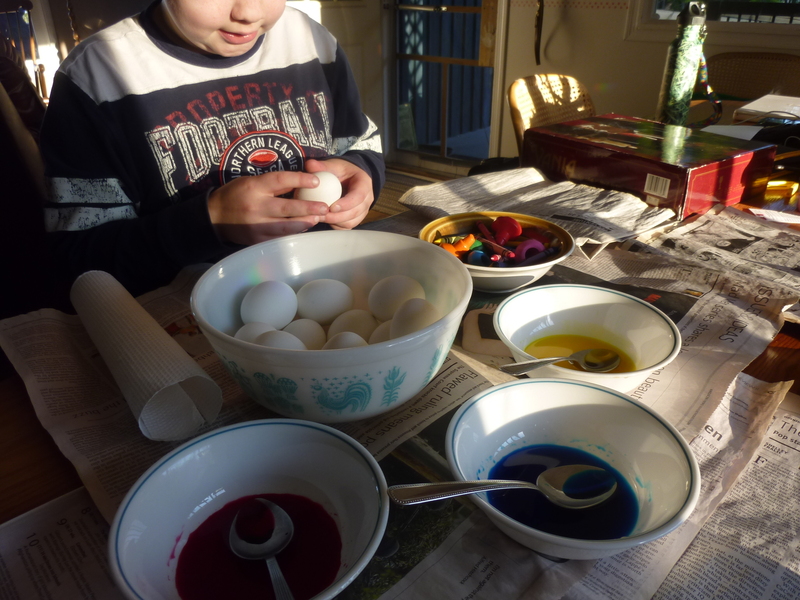 Yesterday I boiled a dozen or so eggs and we dyed them using crayon resist, and food colouring. H will usually amaze me with something like a Storm Trooper or Darth Vader egg. 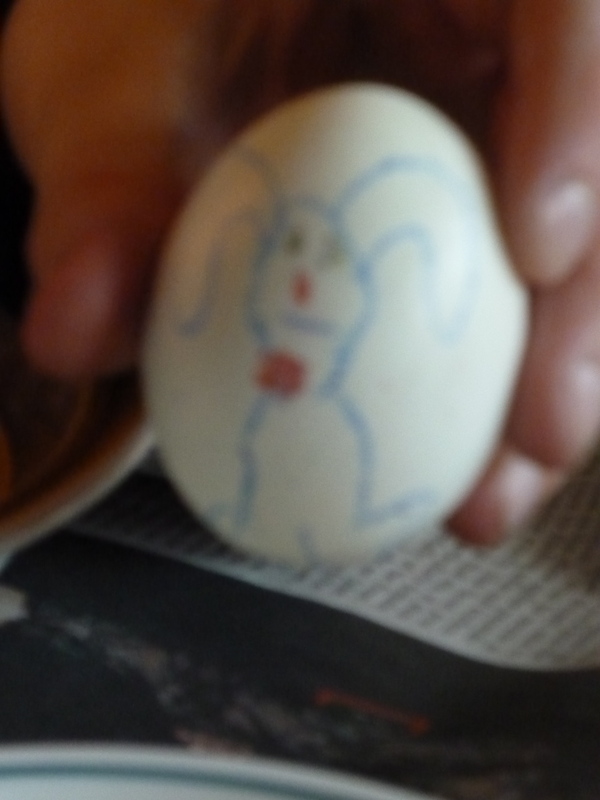 This year he was more traditional, and made a bunny, and other eggs with fabulous designs. We all participated. I can sense that H is on the brink of letting go of his belief. It defies his logic – but we will let him take the lead with this. I learned my lesson a few years ago when I was convinced that it was socially inappropriate to allow H to be the only child his age who still believed in Santa. I thought he had enough challenges with “fitting in” and I didn’t want him to be targeted or socially vulnerable because of this. I was convinced it was time!! We explained that Santa had once been a real man, Father Christmas or St. Nicholas, and that now there was a tradition which was more about the spirit of love and giving and that really all of us were Santa Claus. H seemed to get it. I thought I knew what was best… Meddler! I had certainly not anticipated this! We had to scramble and do some major repair work with H. Luckily the woman who ran the daycare had a certain magic about her and she was able to mitigate the damage. I am pleased that no child was irreparably damaged – including mine. Traditions, and the stories that go along with them, are meaningful and important to my child. I do not rush his development in other areas. I understand that he needs to go through the different developmental stages at his own pace, and seemingly in order. And too – life is tricky enough for my guy: if he can still find his way to be delighted by the magical aspects of childhood – who am I to rob him of this? I think we can all afford to look for ways to find joy in our world and create wonderful traditions. Really, any excuse will do… we even celebrate the dog’s birthday! It was an amazing way to start the day and it was lovely to witness H’s delight this morning as he bounded about, still thrilled by the tiny footprints and the hidden treats. 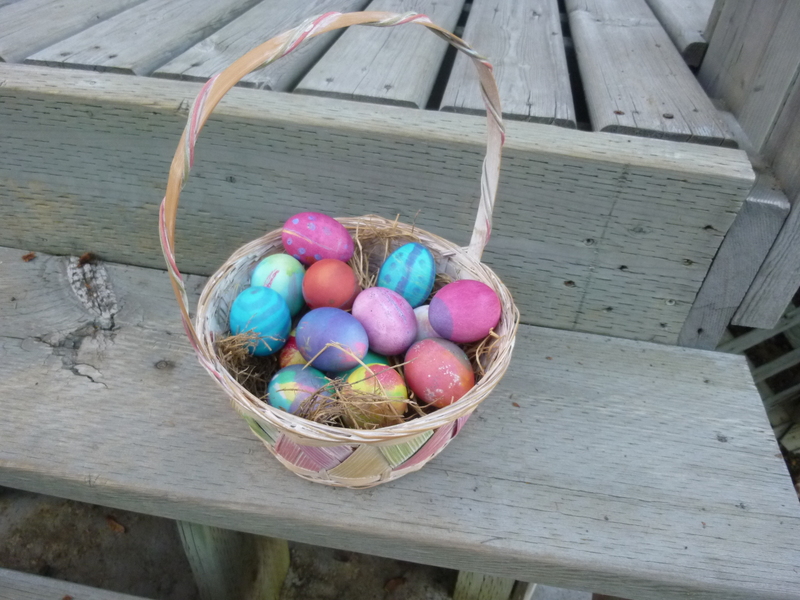 This entry was posted in Autism and tagged Autism, believe, childhood, coloured eggs, easter, handling change, imperfections, magical, pace, resiliency, routine, Santa Claus, struggle, traditions. Bookmark the permalink. 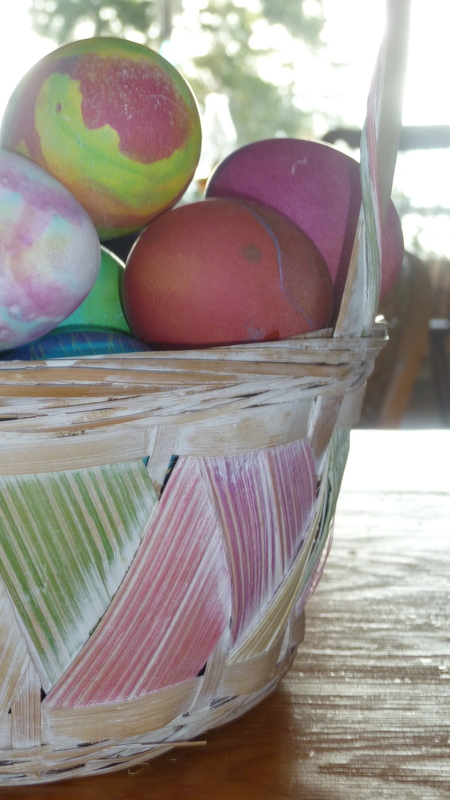 An Easter post from the 30 Days of Autism Archives: still relevant (and also rather amusing).